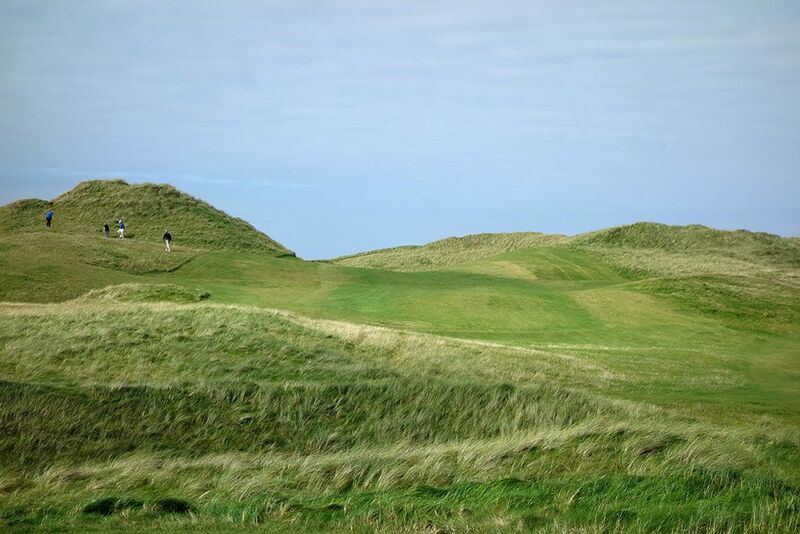 Course Website: Official Website - Visit Carne Golf Links (Hackett 18 and Kilmore 9)'s official website by clicking on the link provided. 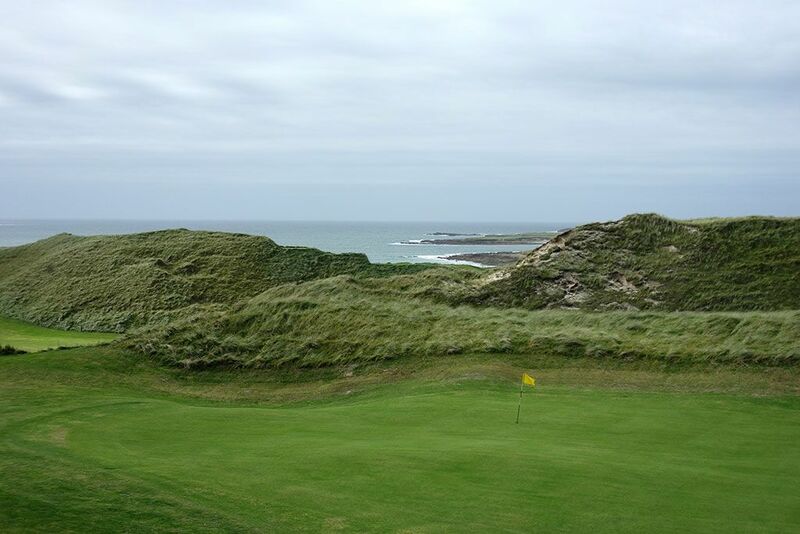 Accolades: Ranked 11th and 12th best courses in Ireland by Golf Course Gurus. 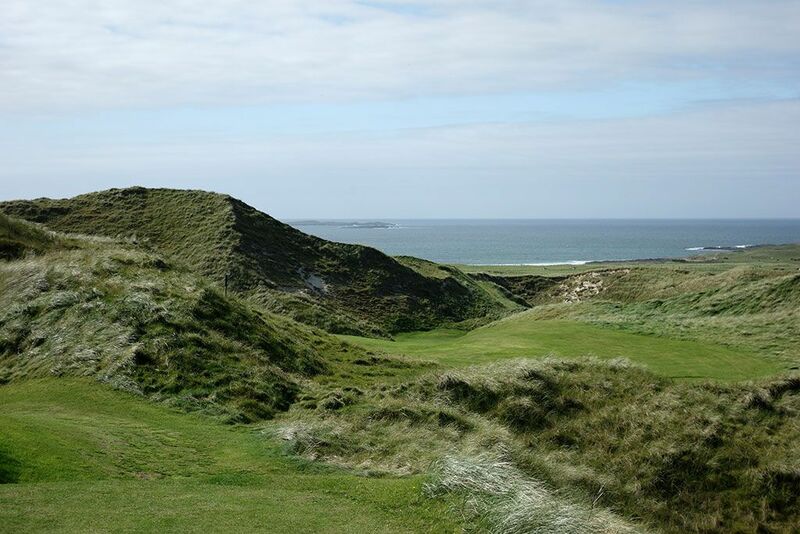 What to Expect: Located on the north portion of Ireland's western coast affectionately known as the Wild Atlantic Way, Carne enjoys one of the most extreme landscapes you'll find on a golf course that still encourages players to walk; though carts/buggies are available. The choppy landscape seems to mimic the waves of the nearby sea and results in uneven lies, occasional blind shots, and very memorable terrain. In fact, I counted 18 total flat lies on the course and they were always on the tee boxes. While that statement is an exaggeration, you'll quickly find you'll need to adjust to a variety of lies, wind conditions, and elements while tackling Carne. 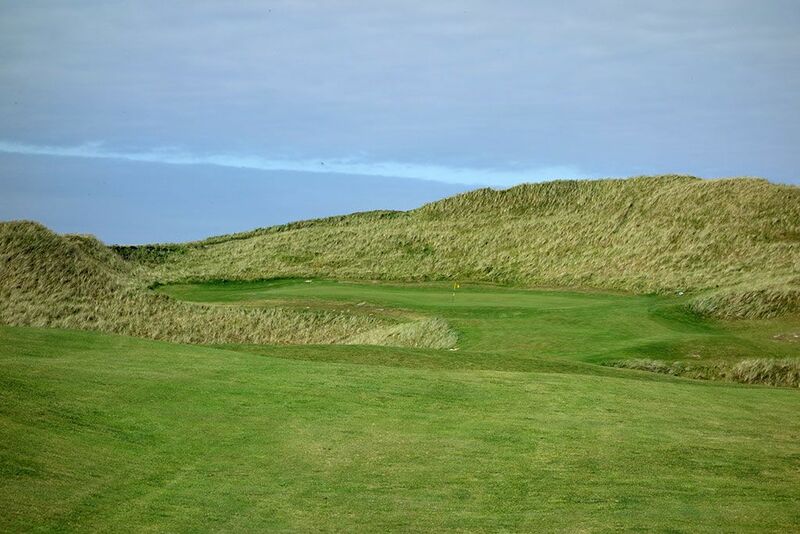 The course enjoys 27 holes, the original 18 named after late architect Eddie Hackett and the newer nine dubbed Kilmore which was originally to be a Jim Engh design but was completed by Ally McIntosh. If plush conditioning is your priority, then Carne isn't for you. Carne is a rugged, natural golf course where conditioning takes a back seat to magnifying the dunescape and dramatic terrain. Carne is not a terribly long course, but it doesn't need to be due to the elements you'll often face in this unique location. The holes play differently every time based on how the wind, rain, and your swing show up that day so be prepared for anything. Former Sports Illustrated writer John Garrity famously put Carne #1 on his Top 50 courses in the world list, an impressive distinction considering how many renowned courses he has teed it up on. While I don't share Garrity's view on Carne's elite status, it is absolutely a course you should make a priority to visit when in Ireland. Signature Hole: 11th (Hackett) Hole – 363 Yard Par 4 – Carne has about as much variety as any links course you'll play and the 11th stands as the most unique and creative hole on the property. 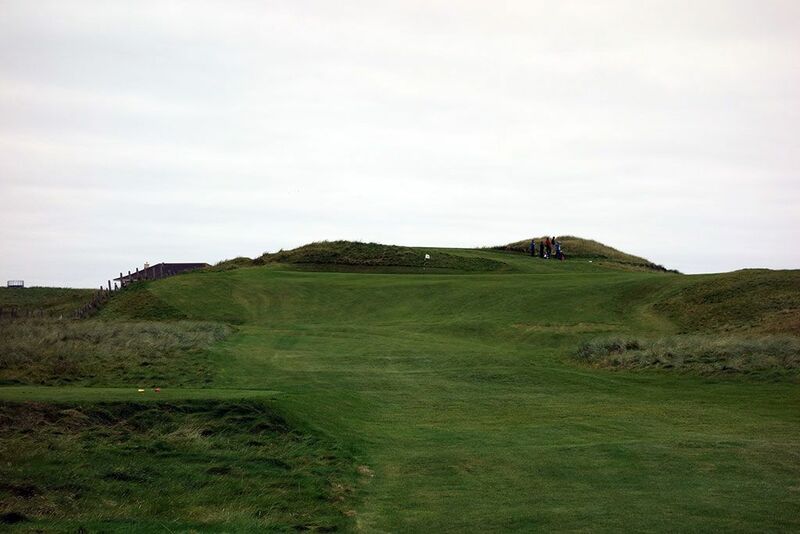 From the tee players will have a difficult time seeing the green as the fairway doglegs right behind a massive sand dune that is as looming as any I've confronted on a golf course. 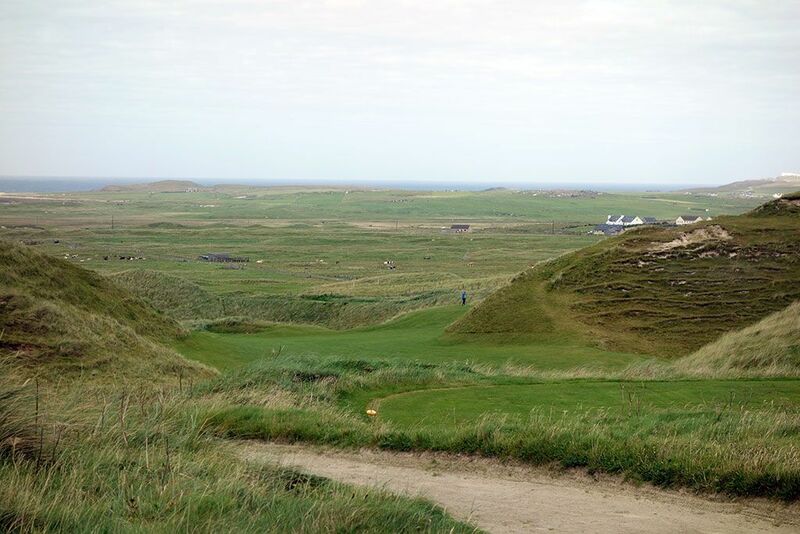 The 35 foot descension to the corner of the dogleg brings its own perils as players teeing away from the dune may find their drive skipping through the dogleg and into the rough. A 320 yard rip over the dune will find the green though there are safer lines to be taken down the left. The instant I got done playing this hole I wanted to head back to the tee and play it again; a sure fire way you know you've played a great hole. 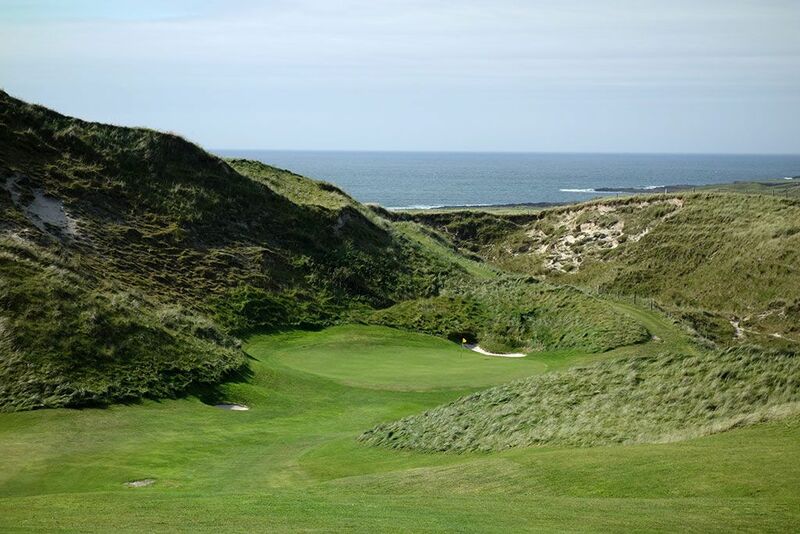 Best Par 3: 7th (Kilmore) Hole – 229 Yards – A stout test awaits you at Kilmore's 7th hole as players attack this green that is perched atop the dunes with a steep falloff fronting the green. A small chipping bowl sits at the front right portion of the green and the undulations in the putting surface create some tricky putts to certain pin placements. The view from the green back out to the ocean is brilliant. 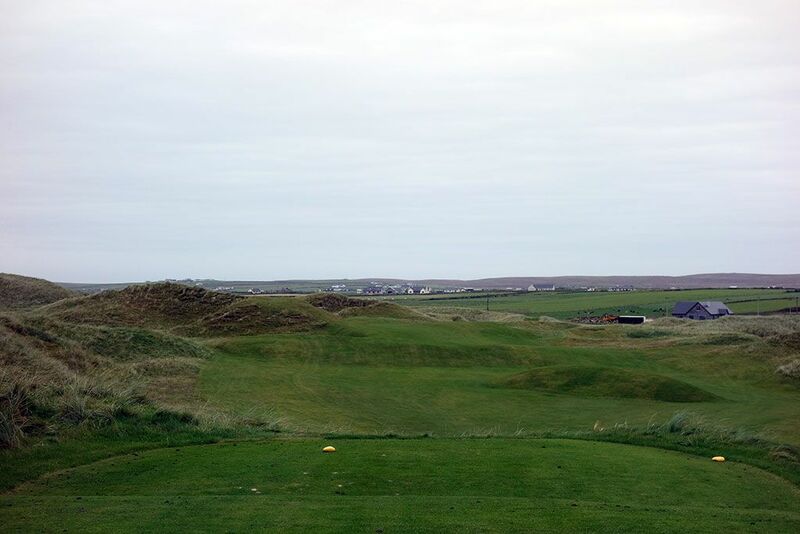 Best Par 4: 8th (Hackett) Hole – 399 Yards – From the tee side that offers expansive views of the surrounding countryside to the amphitheatre green surrounded by menacing dunes, the 8th is one of my favorite holes at Carne. Even with a tail wind, the perilous play is challenging the cratered dune up the left side that protects taking a direct line at the green and requires 300+ yards to carry. Playing straight down the fairway however comes with its own set of challenges as balls will kick to the right off the undulated short grass and into the gnarly lies that await. The green features a significant tier that creates an additional line of defense for pin placements in the back third of the putting surface. 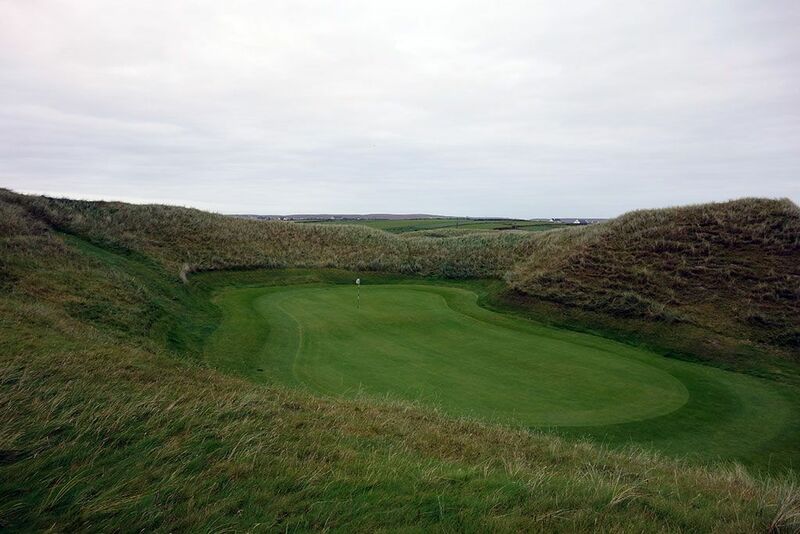 Best Par 5: 1st (Kilmore) Hole – 561 Yards – The opening hole on Carne's newest nine plays between the dunes that separates the 1st and 10th hole of the Hackett course. The blind landing zone presents a mental challenge to contend with while the approach shot creates a physical one. The left â…” of the green is protected by a small chasm while the right side features an inviting approach way. 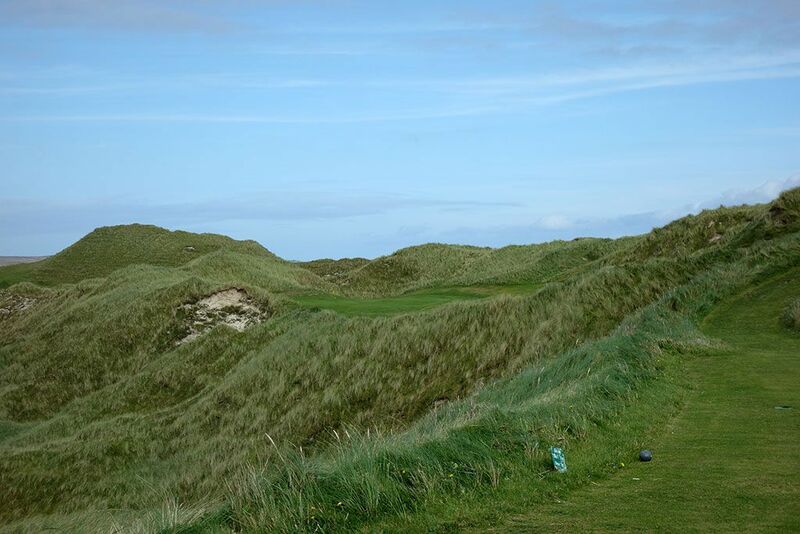 The green sits at the base of a large dune in a naturally beautiful and protected setting. 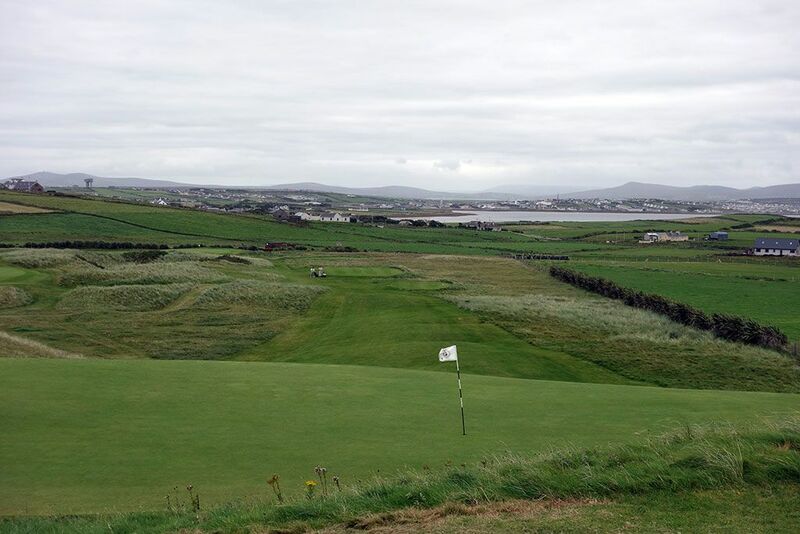 Birdie Time: 3rd (Kilmore) Hole – 342 Yard Par 4 – A short downhill hole is the perfect recipe for success when trying to take a stroke back from Old Man Par and you get it here at Kilmore's 3rd hole. Inspiring views are had from the tee box with waves from the Atlantic crashing in the distance and a majestic dune framing the left side of this inviting hole. A big drive could find the speed slot and tumble all the way down to the green and thus setting up a near guaranteed birdie, but player who play it safe off the tee with still find a welcoming approach shot to a green resting at the base of the surrounding dunes in a setting safe from wind coming in from the left. Don't feel like flying it to the green? Whip out your putter or hybrid and punch one down the neck leading up to the putting surface and watch your ball roll and tumble its way to the putting surface. Carne is chuck full of fun holes and this stands tall among them. Bogey Beware: 7th (Hackett) Hole – 177 Yard Par 3 – 177 yards doesn't seem too intimidating until you stand on the tee box looking skyward to the raised green that boasts the nastiest false front you can imagine. I would put my life savings on the fact that at least one person in your foursome will watch their ball tumble down to the divot-laden base of the hill the green sits on; and I'm guessing 2-3 players will end up with the same fate. Going long over this narrow green isn't necessarily a play for safety as gnarly grass awaits those that carry their tee shot deep and are stopped by the hill backdrop. This is a flat out tough hole and one where a big number can happen in a hurry.